Line your tart pan or baking pan with the piecrust, gently press down on the top of the pan to remove excess dough. Pierce the dough with a fork and place in a 450˚ oven for 8 minutes. Remove tart shell from the oven and let cool for a few minutes. In a medium bowl, whisk the egg then combine the ricotta cheese, chive cream cheese, ½ of the Parmesan cheese, salt & pepper. Fill tart or tarts with the cheese mixture. 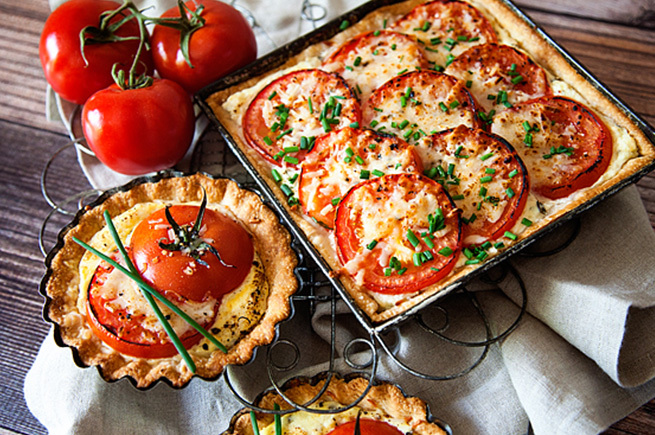 Top the tart or tarts with fresh sliced tomatoes. Season the tomatoes with salt & pepper and then top with Parmesan cheese. Place in a 400˚ oven for 30 minutes for a large tart and 20 minutes for small tarts. Remove from oven and let cool for a few minutes, and then serve with a nice garden salad.